Vewy intewesting ordaw younk man! I know you said — no particular order — but I loved that “It” was number one! My fave, absolute fave! Of course, I have read them all. I can live with that list. All of my favorites are on there except for Joyland and maybe Misery. For some reason Joyland hit me in a way few of his have during the past decade, except for possibly 11/22/63, which I consider to be one of the finest novels ever written. Richard, I think you need to reconsider “The Long Walk”. I know you haven’t gotten to it on your re-read list, but I’m confident you’ll find it’s better than you remember. I was genuinely wow’d when I came back to it years later. It surely deserves to squeak in at #14 of your top 10. Geez that was hard after #5 or 6!! So many choices. So many feels. Revival was just a boring book with no real action. Totally agree! 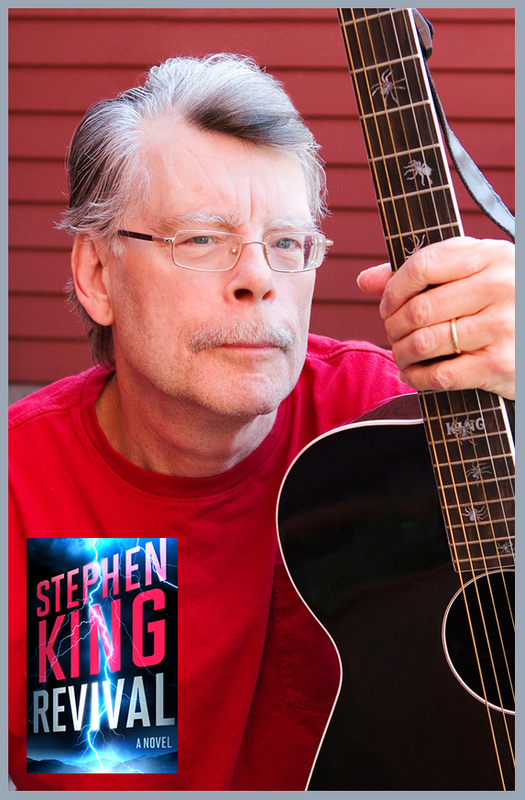 Most of his recent novels are boring…only exception is 11/22/63. Well, to each his own I suppose. I just loved the homage to Frankenstein & Shelley herself. Loved the running commentary on the fallacies of organized religion. And while the action was definitely light, I found the slow (if obvious) build to the climax was half the fun… Jamie’s story begins under the literal shadow of Pastor Danny & symbolically never gets out from under it, very much like the narrator at the end of Poe’s “Raven”. It was a Journey, not a Destination for me. And that ending! One of the top creepiest descriptions of the afterlife ever. #1 is a toss up for me, between The Gunslinger (first in series) And It. The other 9 include the rest of the Dark Tower series in no particular order and The Stand. The Stand And the Dark Tower Series are some of the very few( and I read voraciously!) books that make me cry. Bag of Bones is very good, as is 11/22/63. I have heartily enjoyed ALL of his writings, and hope to keep reading him in future. Just finished Revival and enjoyed it tremendously! Ask me tomorrow and you might get a slightly different list, but not by much. I feel bad for not being able to find room for Duma Key. And Carrie. And Pet Sematary. And The Stand. And Misery. And Salem’s Lot. And…well, I guess I’ve got to stop somewhere. It would be like picking out your favorite child. They’re all up there, each in it’s own special way. Here are my top ten SK books. Even though some of them are on that list you gave. I realise the DT series is more than one book, but I cannot pick just one from the series. My favorites in order are 1. The Stand, 2. The Dark Tower series, 3. It, 4. Doctor Sleep, 5. Thinner, 6. Desperation, 7. The Cell, 8. 11.22.63. 9. Carrie, 10T Under the Dome, 10T Duma Key, 10T Firestarter. 1. The Stand… far and away my favorite! So glad to someone else besides me included Insomnia! Insomnia is definitely another favorite that, even though it wasn’t in my top 10, it is definitely one of my favorites. YIKES I don’t know HOW I left out the Regulators. LOVED that book! Ok, Rich, you got this all turned around. In no particular order, Gerald’s Game, Misery, It, Cujo, Christine, Needful Things, Bag of Bones, Tommyknockers, Pet Sematary and Different Seasons. Don’t make me have to tell you again! and since Richard did it…. Even though I cheated, it is amazing how many great books didn’t make my list. I have the same top 3 (different order though. Switch IT and The Stand and you’ve got it). Glad I’m not the only one who loved Wizard and Glass…it’s my favorite in the series. IT – I was definitely a Loser! Firestarter – this one hooked me forever! Pet Sematary – Scared the Hell out of Me! Different Seasons – Rita Hayworth and The Body. Two fantastic movie adaptions that no one knew S. King wrote until the credits. The Green Mile – Read the first installment on my engagement weekend to my wife. How could anyone let John Coffey be killed? Joyland – Another coming of age story wrapped inside a mystery. I would have liked to have worked at Joyland just one summer. Dr. Sleep – The first in what I hope will be S. King’s revisitation to some of my favorite characters. Next, what are Stu and Frannie doing in Boulder these days? Richard, thanks for the inspiration to walk down memory lane. Now back to page 150 of Revival. Just ten? Honestly, I can’t limit my list like that. And some of the collections – well, let’s just say they deserve to be counted too… so those will appear at the end of my list. SALEMS LOT – you never forget your first SK book, or your first Glick. THE SHINING – my house, though much smaller, seemed to enlarge when I was alone in it: the basement was room 217, and the shadows could’ve been little girls….or worse. 11/22/63 – wow: historical fiction, suspense and maybe SK’s most emotional love story (with apologies to Lisey’s Story). IT – Pennywise may be his scariest creation; and since I couldn’t pick the Body boys, I choose these. CHRISTINE – everything I was thinking about being the teenager I was then. JOYLAND – it’s The Summer Of ’42 meets my first heartbreak on the North Carolina coast; it will surprise (and move) you. NEEDFUL THINGS – so wickedly funny, and scary. PET SEMATARY what wouldn’t a father do? Ok, on second thought…. DRAWING OF THE THREE – the best of the series; and one of the best of all. MISERY – as I was reading, I wondered if that’s what SK thought of me, a constant reader; tied with The Stand, Duma Key, The Green Mile, Firestarter and special mention to Anthologies (“…they taste just like lady-fingers”) and On Writing which are scary good in their own “write”. All good lists; did we all choose The Stand? Hands down that’s my favorite (the uncut version); second would be The Talisman. Third and on would be the entire Dark Tower series, though I also have a soft spot for Eyes of the Dragon. It’s *OLD* school and *NEW* school. IT/LOT/SHINING/STAND/Talism/Buick8…. Take a pick. Anywhere on that list. …*MID* is weak…Joyland/11/ really good recent to bring back. … Insomnia my fav,…..no reason…. Oh crap I forgot The Shining and Dr. Sleep. I also love Mr. Mercedes and Revival, but they are too new to go on a favorite list. The Kennedy time machine one! Couldn’t nail it down to just ten.. Thanks for all of your great books Stephen!!! I can’t choose a top ten. Can I just say ‘all of the above’? 🙂 I do have a soft spot for The Girl Who Loved Tom Gordon. I have a soft spot for The Girl Who Loved Tom Gordon too…I read it only a few years ago for the first time and I still think about it from time to time. It’s definitely a good one! P.S. — High Honorable Mention to “Cell.” It just didn’t come off as well as anticipated, even though the sentiment of blowing up the head of all cell phone users is truly worthy and appreciated. Top Ten is easy, how about Bottom Three. The ones you read once and said … I expected more. Which is interesting because, when asked, Stephen King says Lisey’s Story is his favorite. I think my own, on-going reread of all of his books will likely bump Duma Key and Lisey’s Story into this list – maybe Joyland as well – although I have no idea what would move down…. Its hard to pick 10 favorites when you love them all but here it goes.. Ask me again & my list might change! Well, it’s funny that the post above mine from blugilliand is positioned so. I was reading all the lists and I have to echo what he said. My number 1 is The Dark Tower “Octology”. I too, consider it one, “Tolstoyesue” novel. I sat on Blaine the Train for so many years wondering what was going to happen and then SK had the horrible accident and he picked it back up with Wizard and Glass. It’s just a classic story that will undoubtedly be considered one of the greatest works of this era. I can see college students readiing, learning and debating meanings in a U. of Maine class in the year 2215 like they do with Shakespear, Dickens, Tolstoy and other greats today. Talk about a legacy! Regardless of ranking, I can honestly say I haven’t read one I didn’t like. While I was writing my post, it’s obvious a couple of other folks were writing faster! Also, my made up word to describe The Dark Tower was meant to be “Tolstoyesque”. Actually, Richard I think you lied twice. You said no collections, but Hearts in Atlantis is a collection. Agreed, great book (I read it serially and THAT was cool!). Also a great movie. How many know that The Shawshank Redemption is the #1 movie on IMDB.com’s Top 250? Check it out…also, The Green Mile is at #43 and The Shining is at #58. Not too long ago, they were all in the top 50 but the last two have been pushed down a bit recently. Not too shabby for “just a horror writer”! IT doesn’t count, because, for me, IT i’s simply the best. In my opinion, the writer’s Bible ON WRITING, is a yearly mandatory re-read. I wish there was a church where we could chant: “Read, read, read widely…” every Sunday! Another not in order post – mainly because it changes from day to day. Pet Sematary – damn this book is dark. The blip when Louis pulls the cotton from Gage’s mouth in the cemetery – gives me chills every time! The Long Walk * – an overlooked gem. Honourable mention has to go to – On Writing – it’s not a novel otherwise it would at the top of my list. Notable absence from the top ten – IT – a great book but for me it’s always hobbled because the characters don’t remember what happened. Your list of the top 13 is great. My list is similar–although number 1 is The Stand, and number 2 is The Shining. 3 is The Dead Zone. I love the Dark Tower series but the # 12) 11/22/63 is the BEST!!! 4.The Eyes of the Dragon. I love that so many of you posted your own lists — thank you! Books on my Honorable Mention list include: THE LONG WALK (hard to believe he wrote it at such a young age ), MISERY (so hard to leave off my top list ), INSOMNIA (I know I’m in the minority here, but I loved it ), JOYLAND (such a cool , sentimental story), and REVIVAL (a LOT happens in this book, right below the surface). Richard – This is a great list! IT, THE SHINING, THE DEAD ZONE, THE STAND, HEARTS IN ATLANTIS, THE GREEN MILE and THE LONG WALK are definitely in my top tier. When I first read CHRISTINE as a teenager, it was at the top of my list… but I was under-whelmed when I re-read it a few years ago. Also, I have read JOYLAND twice, and it definitely has a place in my top ten. FROM A BUICK 8 and INSOMNIA are two of King’s most intriguing books, but they don’t quite work for me. I’m looking forward to reading what you have to say about them. Have Brian Freeman and Bev Vincent created top ten lists?? I have not. I don’t do top X lists, I’m afraid. My mind doesn’t work that way. I can’t rank things in order or pick favorites. Is this number 6 or 7? It would take me years! 5 The Regulators – Bachman – #4&5 are def’ly in my TOP FIVE, but it’s not easy! 8 The Dark Tower Series – Roland Jake Oy Eddie Susannah Blaine – all things serve the Beam so all are one! A lot has to do with when you read them! I associate times in my life with each of his books. Needless Things (lol) should be Needful Things. Can you tell I’m working on Discarding as my New Year’s Resulution? Freudian slip. I’m going to cheat and put the entire Dark Tower series as number 1. Cumulatively they are the greatest story ever written IMO and if I were forced to choose one over the others it would be the wolves of the calla, my single favorite book ever. 2. The Stand, the next greatest book after the Dark Tower series. 4. The Shining, scariest book I ever read, still bothers me. Honorable mention goes to Firestarter, which is the first King book I read. I came to this party about three weeks late but wanted to join in the reading. I thought I might could catch up and read along. I revisit SK’s novels frequently and in chronological order but this would be the first time I had done it with other Constant Readers. So, early this morning, about 3 am, I finished “The Talisman” and started “Thinner.” Am I the only one still playing? I hope we’re not the only ones still playing! There haven’t been any updates for a while. I’m almost done with The Stand (original) so I hope Richard is still reading too. I’m still in the game. I just finished Firestarter and started Roadwork today. 1. The entire Dark Tower series. honorable mentions to: Chrstine, It, The waste lands, Bag of Bones. Although I am only half way through Under the dome, and haven’t read any of the later novels (except joyland). I have read all his previous fiction. Seems telling that of my top 10 and honorable mentions, on one book was written in the last 25 years or so. Should also mention that The Stand isn’t just my favorite SK book, but my favorite book period. Good list, most of yours are on mine as well. I love all King books except “Revival.” I was so disappointed! 3. Pet Sematary…….or is it Semetery? I love lists. When compiling this, I tried to recall how each book affected me at the time when I read it and then factored in how much I still think of them. It was difficult to not include some of his short story and novella collections as I’ve loved a number of them too; perhaps another list. Looking at some other people’s choices I was taken aback at how many of his novels I have yet to read…well not really a lot but… The only one I won’t most likely tackle is Pet Sematary; I’ve been told by EVERYONE who has read it that you will never feel the same about your pet after reading it, and I love my dog too dearly to have creepy feelings come between us. I never have the time to read SK novels really, maybe 1 or 2 of the individual stories in collections. So, I haven’t even read half of them, maybe just over the requested 10. That said, I’ll work it out as I make my absolute favorites list. I´m a Cuban Constant Reader of Sai King. I started reading his books in 1990 and I´ve read almost all of them so far, with a few exceptions like Faithful, The Secretary of Dreams, Six Scary Stories and Flight or Fright. Thanks to my friends abroad (in the US, the UK and Germany) I have had the oportunity to enjoy those great and wonderful stories because only one of his book have been published in Cuba, it was The Shining (El Resplandor) translated into Spanish. I hated The Stand. Not crazy about The Shining. I found IT boring, so never finished it. The Talisman was garbage. Most of the others I haven’t read. I loved Shawshank, The Body, and Apt Pupil from Different Seasons.